Leon Logothetis, host of Netflix’s The Kindness Diaries and previously of Amazing Adventures of a Nobody, presents an adventure journal that encourages readers to tap into the life-changing power of kindness by trying something new every day for one month. If you want to be happy, all you have to do is . . . Go Be Kind. 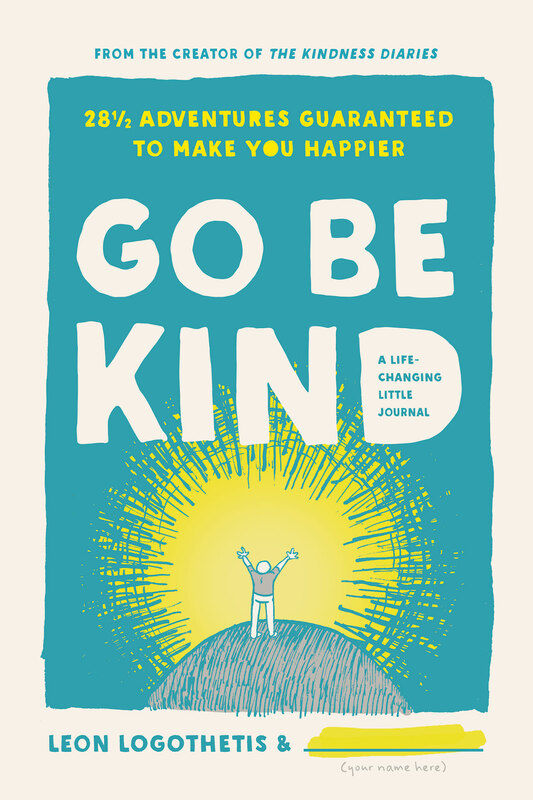 Go Be Kind isn’t just a journal or another how-to guide to getting what you want. It’s a series of daily adventures that will help you rediscover the greatest human gift—kindness—connecting you with others, and helping you create a happier life. This life-changing book is filled with highly classified missions, treasure hunts, dream dates, left-handed writing, awkward moments, and daily adventures that are guaranteed to change your life. You will become best friends with total strangers. Some of the adventures can be done while you’re falling asleep at night. Some of them will open your eyes to things you’ve never seen before. And all of them are really easy. It might take 28 ½ days. It might take 11. Or you can take all the time you need (the adventure is up to you). Because once we start being kind, we realize that there is no faster way to happiness. It will change how you see the world, how you connect with other people, and how you connect with yourself. And it starts with you. All you have to do is change one life in order to change the world. You ready? Leon Logothetis is a global adventurer, motivational speaker, and philanthropist. Leon has visited nearly 100 countries and traveled to every continent. He is the star of the Netflix series The Kindness Diaries, where he circumnavigates the globe on his vintage yellow motorbike Kindness One, giving life changing gifts along the way to unsuspecting good Samaritans. Prior to The Kindness Diaries, Leon was host of the TV series Amazing Adventures Of A Nobody, which ran on National Geographic International for three seasons, following Leon as he crossed America, the United Kingdom, and Europe on just five dollars, five pounds, and five euros a day, respectively. Leon has documented his travels for numerous media outlets including CBS This Morning, Good Morning America, CNN, Los Angeles Times, San Francisco Chronicle, Outside, Huffington Post, Psychology Today, and the New York Times. He is the author of three bestselling books: Amazing Adventures of a Nobody, The Kindness Diaries, and Live, Love, Explore.